He said on The Jonathan Ross show: “I haven’t been asked. I was delighted to hear they’re doing some more. Visit the link above for more. And when is someone going to ask Denis Lawson if Wedge will be back? Because it’s April Fool’s Day, we really don’t know what to make of this once, except it’s absolutely true. Earlier today, Peter Jackson released around a six minute excerpt of the live event that was done the other week to preview The Hobbit: The Desolation of Smaug. During the video, Peter Jackson bends down to retrieve some artwork from a drawer in a coffee table in front of him. As Jackson pulls the artwork out, some other papers fall out for only a brief second. 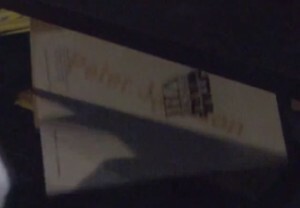 One of the documents that falls down is a Star Wars Episode VIII script that is labeled Peter Jackson. This all happens at exactly the four minute and fifty-one second point in the video, so you can check it out with your own eyes. FX: Will we be seeing even more Star Wars influence this time out? “I wouldn’t say that the first movie is an absolute Star Wars derivation. The irony of course being that Star Trek came out before Star Wars. We’re inheriting Star Trek, so we’re allowed to do space stuff. Of course when Star Wars came out, people referred to Star Trek, because it was spaceships. Everything is sort of a derivation of everything else. Just the way Star Wars was of Flash Gordon and of dogfight war films in the TIE Fighter sequences. Everything has something it borrows from. Visit the link for more. Finally, Josh Lange created this fun mashup of the “Little Miss Sunshine” poster and “Star Wars.” Click the link for details! When can we expect the Episode VII Title and Trailer? 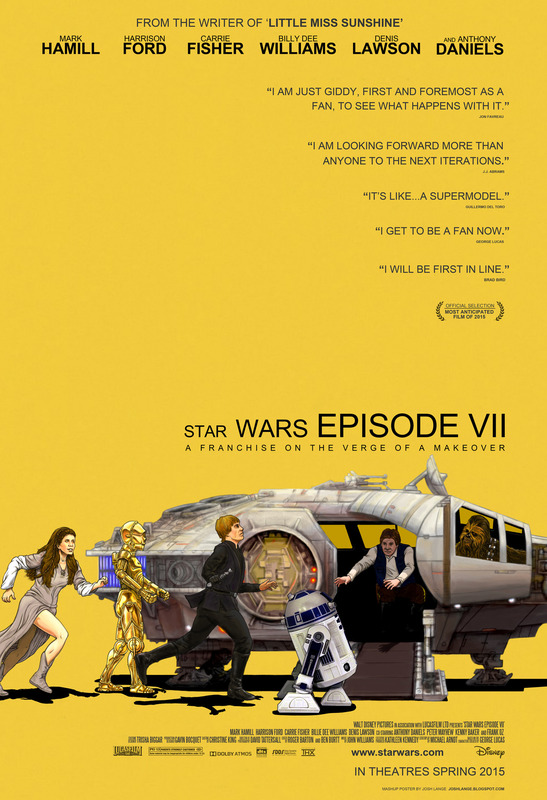 As plans for “Episode VII” develop, there are going to be many rumors about the title and the eventual release date of the trailer. On TheForce.Net, these were big topics of discussion before all three prequels. So what can fans expect for the new Star Wars sequel? Before looking forward, it helps to look back. On “Episode I,” there were many rumored titles years before the official one was announced. They included names like “Balance of the Force,” “Genesis,” “Children of the Force,” “Guardians of the Force,” and “Crusaders of the Force.” While these were all either wishful thoughts by fans or outright fabrications, some rumored titles did have a degree of truth to them. For a while, “Red Tails” was even thought to be a cover name for the film, but it turned out to be the title for George Lucas’ long developing pet project about the Tuskegee airmen. It also turned out that “Episode I” did have a working title different from the final title. Early scripts simply called it “The Beginning.” The final title of “The Phantom Menace” was announced on September 25, 1998 on StarWars.com. That created a resounding, “Huh?” from fans. The announcement was only eight months before the film was released on May 21, 1999. As for the trailers, the first trailers always appeared in the November before the release date. Accurate descriptions of the trailers typically appeared in October before that as insiders started getting sneak peeks at them. Today’s announcement of the shuttering of LucasArts Games and the layoffs that followed has had a ripple effect within Lucasfilm: Layoffs at Industrial Light & Magic. Lucasfilm has long had a strategy of sharing technical resources and staff among visual effects, animation and games. But with production finished on the “Clone Wars” animated series and the next Star Wars animated series not yet in production, and the closing of LucasArts, a portion of its staff was left working only for ILM’s vfx business. The fallout from this is that the recently announced game Star Wars 1313 is now in limbo along with the game “Star Wars – First Assault.” The games could be cancelled altogether or may be on hold according to different news sources. A gameplay trailer for Star Wars 1313 can be seen below. MTV UK also adds that the game was rumored to have starred Boba Fett. NBC News – Raven Software has made the Jedi Knight game source code open to the world. Thanks to the infamous “Star Wars” prequels, we now know that the villainous Darth Vader was not always bad. But the greatest villain of “Star Trek,” Khan Noonan Singh, was literally born bada product of genetic engineering who believed himself superior to lesser men. So, which is the better story? For her part, Dr. Andrea Letamendi, a psychologist, said Vader’s story was more compelling because of its complexity. For his part, “Robot Chicken” writer Hugh Sterbakov did see one common failing of the two diabolical leaders: “They’re both really bad at choosing assistants,” he said, noting that in the accompanying photos for the panel, both men are seen lifting men into the air by their throats. See the full article at the link. TheSpec.com – Stormtroopers in love. See the photos. StarWars.com – The mystery of Luke Skywalker’s robotic hand. Neatorama – Vader, the drone, hunting illegal aliens along the U.S. border. 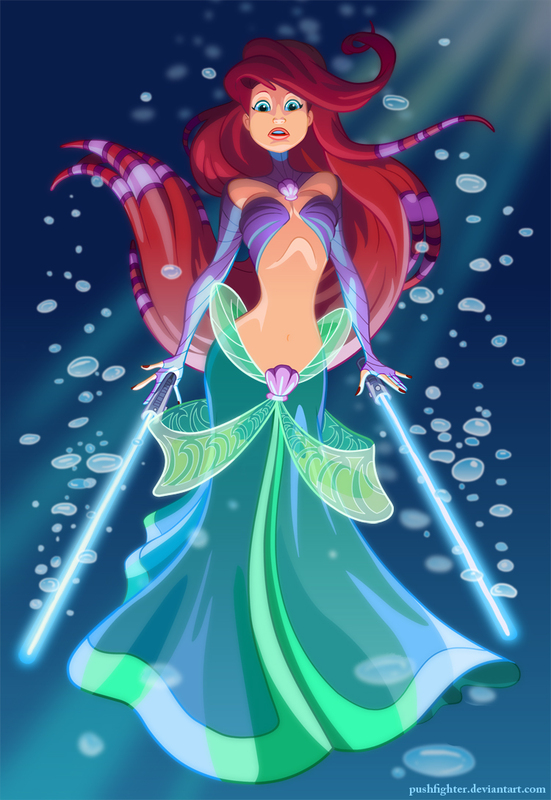 Ralph Sevelius – Disney Princesses as Jedi….and Sith! Thanks to Neatorama for the link. Daily Record – George Lucas attended an event honoring the British film industry at Windsor Castle. Huffington Post – ‘Vadering’ – the new internet meme? Three years before his 1977 film, George Lucas put down on paper his first story set in a galaxy far, far awaya tale of fantastic adventures, daring escapes, “lazer swords,” romance, and monsters. A story of Jedi Annikin Starkiller and General Luke Skywalker, an alien named Han Solo, and evil Sith Knights. The screenplay was titled The Star Wars! 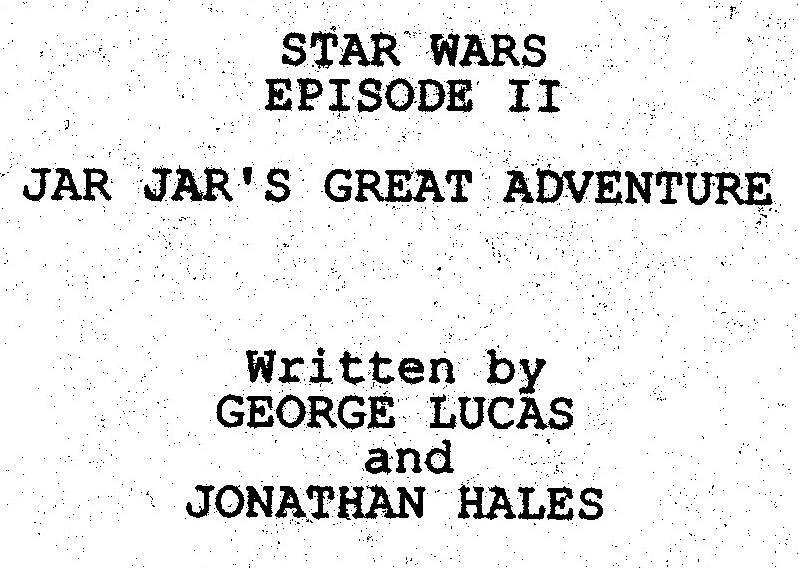 : Lucas did indeed write an opening crawl into his earliest draft. The Jedi Bendu were guardians of peace and justice in the galaxy for 100,000 years in The Star Wars, as opposed to the canonical 36,000 we’ve come to know. And they didn’t serve the Galactic Republic. No, they actually were the personal bodygards of a benevolent Emperor. They led his space forces across the galaxy to bring order from chaos, much the way the Jedi lead the Republic’s military during the Clone Wars. The Jedi and their Emperor were defeated by the “Knights of Sith.” The Sith replaced their rule with a New Empire. It’s Still a Father-Son Story: Like Star Wars: Episode IVA New Hope, The Star Wars is about the coming of age of a young man. But that young man isn’t Luke Skywalker. 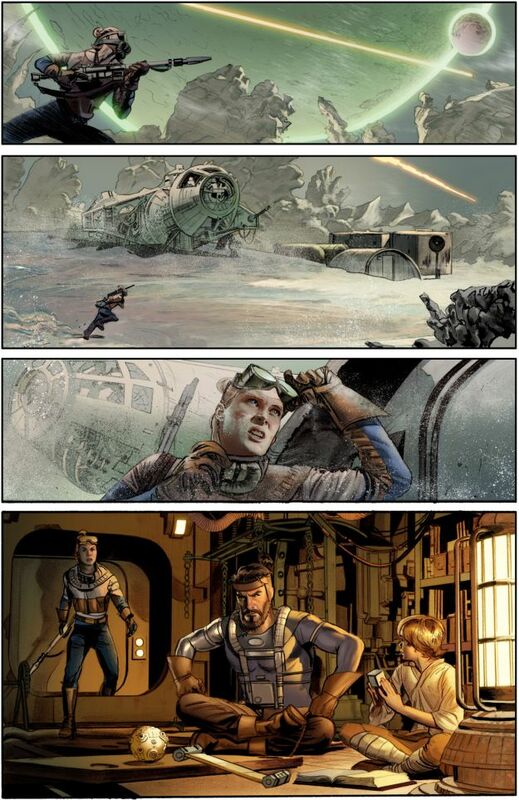 It’s Annikin Starkiller (the name was an homage to Swiss Family Robinson director Ken Annakin), who, with his father Kane Starkiller, a former Jedi Bendu, must leave their home planet of Utapau in the Kissel system for Aquilae, a planet still independent from the rule of the Empire. It’s incredible to think that the word “Utapau” would make it into Lucas’ draft in 1974, but not actually appear onscreen until Revenge of the Sith 31 years later. (For those of you with short memories, Utapau is the sinkhole planet where Obi-Wan duels General Grievous.) And “Kissell” seems to be an early version of Kessell, home of the galaxy’s most notorious spice mines. Visit the link for more details. 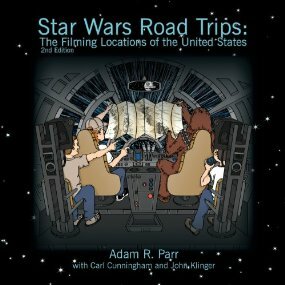 The meticulously researched text gives voice to the groundbreaking and brilliant engineers, designers, and artists that have, in film after film, created the most imaginative and iconic locales. 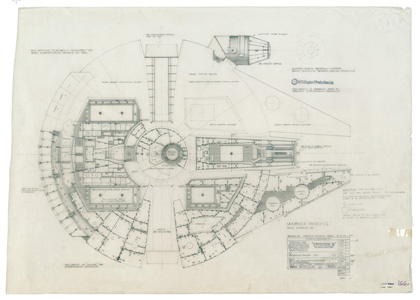 Blueprints shows how in bringing this extraordinary epic to life, early concepts were translated into iconic setsthe rebel blockade runner, the Millennium Falcon, the bridge of General Grievous’s flagship, Jabba the Hutt’s throne room, and many othersthanks to the exquisite craftsmanship and artistry of successive art departments. Thanks to TheForce.net for the alert! Star Wars authors Aaron Allston and Michael Stackpole have several appearances coming up at Dragon’s Lair Comics & Fantasy in Austin. Check his website for details. Read Brad Bird’s Foreword for @jwrinzler‘s MAKING OF RETURN OF THE JEDI book and it’s immediately evident what a huge #StarWars fan he is! A “Star Wars Day” celebration is planned for 4-9 p.m. on Sat., May 4, at the West Sacramento Community Center, 1075 West Capitol Avenue. It will be a celebration of the culture of the movie series, with Star Wars toy appraisals, patrolling Storm Troopers, games, shows, memorabilia, children’s costume contest, and more. Co-sponsored by the City and Toyfusion.com. Hit the link for more info. TheForce.Net alerts us that Femi Taylor (Oola) & Tim Dry (J’Quille & Mon Calamari Officer) have been added to Celebration Europe. 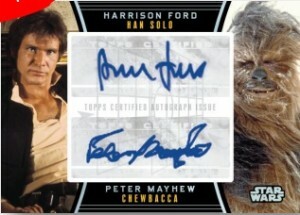 RebelScum.com – Topps has a new set of Star Wars cards on the way that will include Harrison Ford signed cards. Click the link for details. 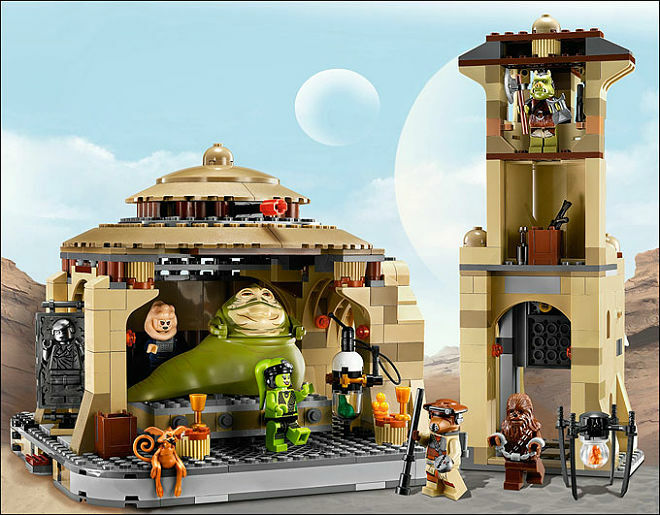 Austrian Independent reports that some controversy over the LEGO Jabba’s Palace has prompted LEGO to announce that they will end production of the set. Toy giants Lego have agreed to remove a Star Wars play set after furious Turkish community leaders said it was racist and anti-Muslim. The Jabba the Hutt set is supposed to show the movie-villain in his intergalactic lair surrounded by his henchmen and prisoners. The row first erupted in January, after a Muslim dad complained when a relative bought one of the toys for his son as a Christmas present. Now Birol Kilic – president of the Turkish Cultural Association of Austria – claims that Lego has climbed down over the row. LEGO typically produces a limited number of their sets anyway, so they had probably finished making the sets anyway despite this group’s claim of victory. IGN – Want the soundtrack to “The Phantom Menace” on vinyl? You’re in luck.